Made of 14k Yellow Gold. 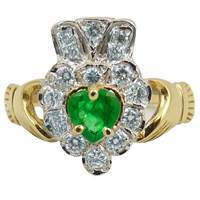 This ring features a Emerald surrounded by diamonds. The crown of this ring also features diamonds. It is an elegant ring perfect gift for any occasion. Made in Ireland by Facet Jewelers. Hallmarked in the Dublin Castle. Available in sizes 4-9, including half sizes. Diamond: .50ct, Round Billiant, Si1 GH. Emerald: Heart, .50ct, Fine Brazilian Green.